MANILA, Philippines – LET RESULT. 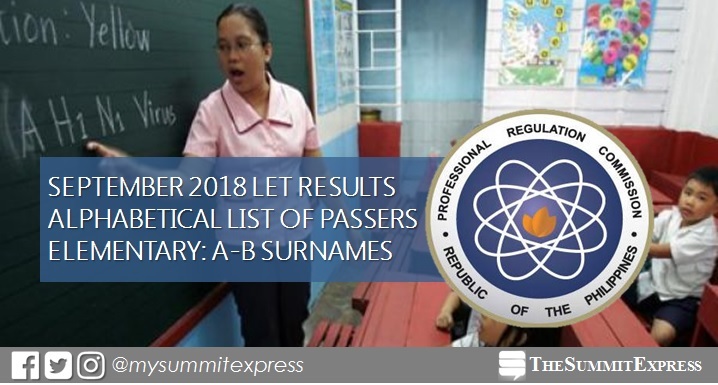 The Professional Regulation Commission (PRC) and the Board for Professional Teachers (BPT) announced today, December 7, 2018 or in 47 working days the list of elementary teachers who successfully passed the Licensure Examination for Teachers (LET) given last September 30, 2018 in several testing centers all over the Philippines. View on this page the alphabetical roll of passers for Elementary level for A to B Surnames. The September 2018 LET covers two parts for Elementary - General Education (40%) and Professional Education (60%). In order to pass September 2018 LET, an examinee must obtain an average rating of not less than 75% and must have no rating lower than 50% in any of the tests, PRC said. Based on PRC Resolution No. 2017-1068, the target release date of September 2018 LET board exam results is on Tuesday, December 4 or in 44 working days after the test.